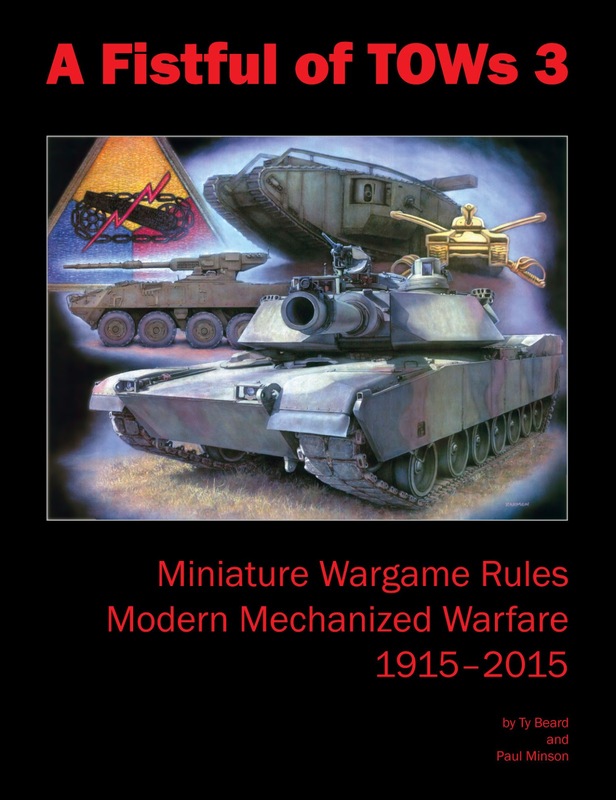 Down Under Wargames - Miniature battles in the Southern Land: Thoughts when on holiday. Getting a Fistful of TOWs in a Bush War full of Nordic Weasels! Thoughts when on holiday. Getting a Fistful of TOWs in a Bush War full of Nordic Weasels! Well at the moment I am spending a bit of the Australian winter visiting friends and family in sunny Townsville... going from 2.1 degrees celsius to 21 degrees... yeah, I think I can handle that! Unfortunately though, it has put a halt on my ongoing city production for the last two weeks, so instead I have used this time to develop the kind of rulesets I want to consider for my games in the future. 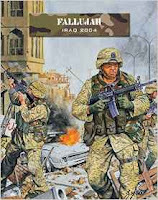 Now I really enjoy 'Not Just a Bush War' by Nordic Weasel Games, but I found the one little hiccup is that the book is focused on the before and after of wargaming - this is great for campaigns and developments, but for actual gaming... well, we need a different ruleset! I have tested a couple of different options now, and I believe I will have come to an answer, but first, to show off what I have tested. 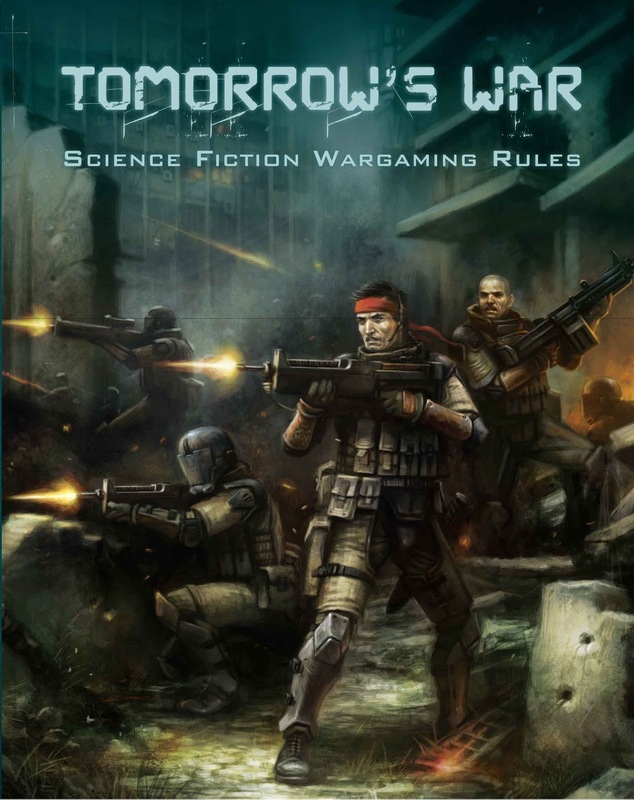 The original rulebook and various expansions, including the TOMORROW'S WAR expansion for sci-fi actions. Eventually, I have come to the conclusion that the best ruleset will be a mixture of different elements of rulesets, with FISTFUL OF TOWS 3 as the primary ruleset. 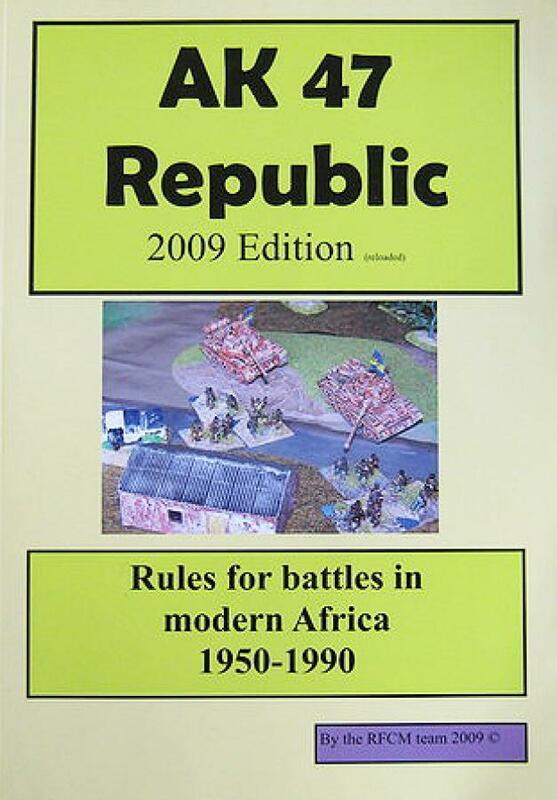 Unique rules: The ruleset is designed for LARGE battles, and allows for combat throughout the ages. Importantly, they allow for activities such as combat engineering, chemical warfare and even atomics.. yes, atomic warfare is definitely too high for what I want - but if I scale down the blast radius templates, I have a brilliant representation of IEDs. Datasheets: The datasheets provided in the book (over FOUR HUNDRED pages long!) 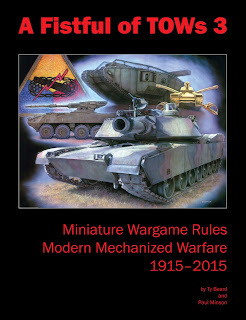 fill a majority of those pages - short of the most modern equipment, there is a ruleset for almost anything and everything. 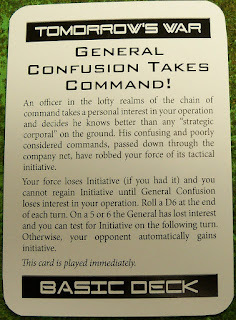 However - like anything, I may enjoy it, but I think it is missing a few things - and a lot of those extra "things" can be found in other rulebooks I have read... and so, naturally, I am going to unashamedly "acquire" some rules from the other books for use. AK-47 Republic - will work with my NOT JUST A BUSH WAR book to help build force composition. 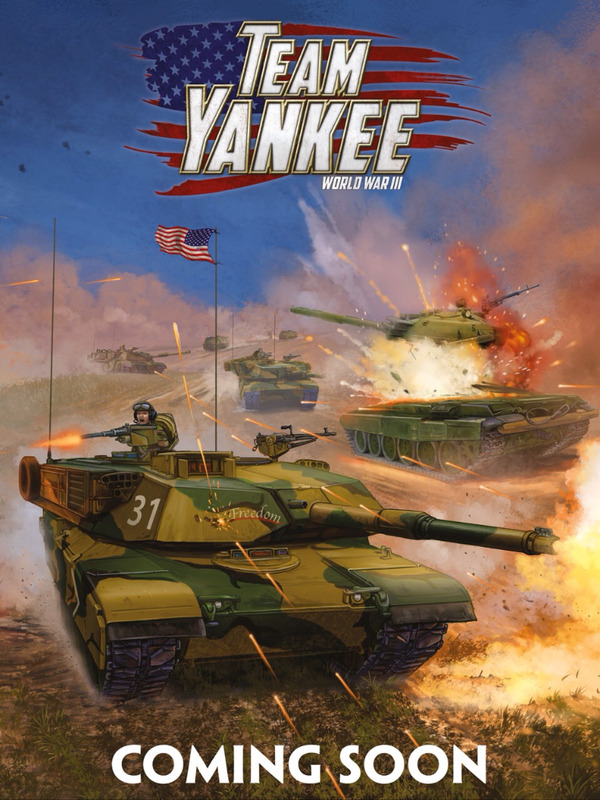 AK-47 Republic has a great army dynamic capability, and while I don't like the "generic" composition (a tank is "a tank" etc), the army dynamics are extremely interesting and will be included in the composition of the future militaries within my Imagi-nation region. 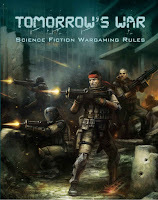 Force on Force/ Tomorrow's War - this ruleset only lost out because of the fact that the game is much better suited to small unit actions. 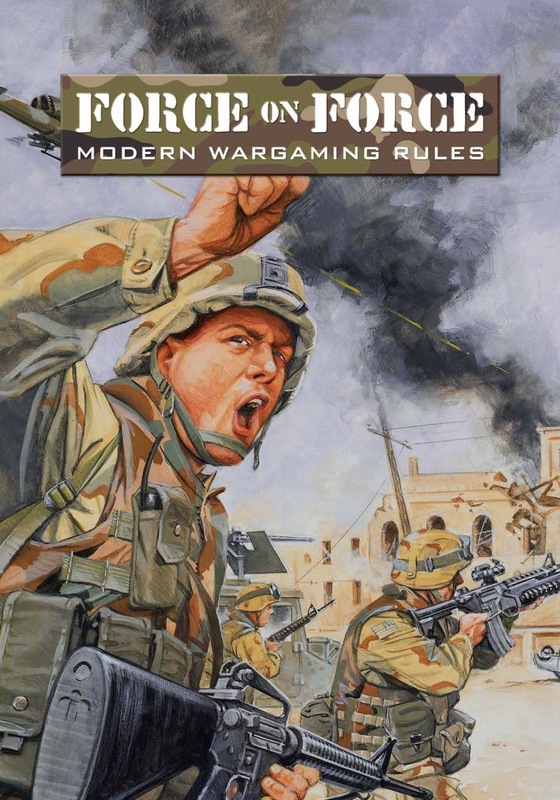 I have seen this ruleset used quite nicely in 'larger' actions by the BIG FORCE ON FORCE lads in Brisbane when they were doing their Malakistan campaign, but it was just a little too small for what I wanted. Different dice to represent success on a 4+ (D6, D8, D10, D12), this will replace the simple D6 mechanic in FFoT3 and be integrated into quality checks, replacing most positive and negative dice modification mechanics involving troop skill and morale checks. Electronic Warfare - Network Centric Warfare. FFoT3 doesn't accomodate the use of Electronic Warfare or Network Centric Warfare, in turn not showing what happens when "The Grid" goes down. Tomorrow's War covers this nicely, and I will be including this into some specialised scenarios and special unit options for high command teams. 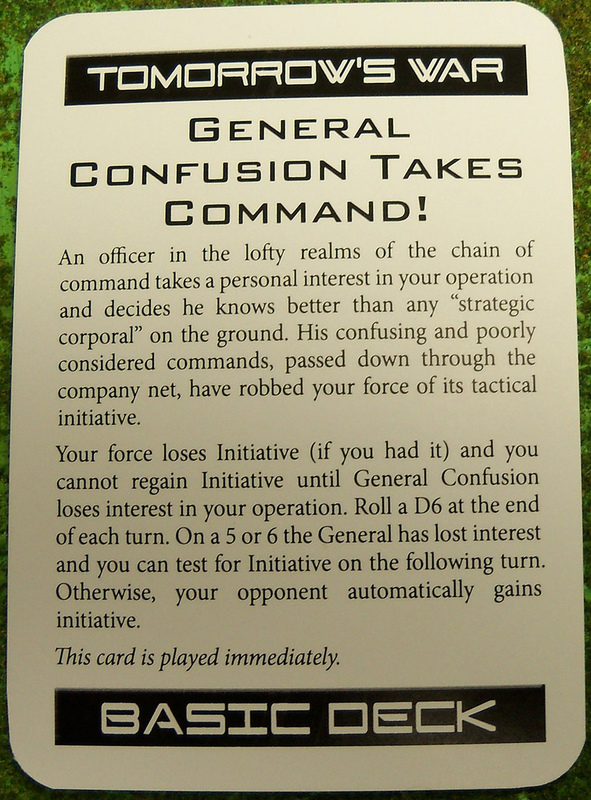 An example of a Fog Of War cardset from Force On Force. Other options can include anything from friendly fire, through to a new Main Battle Tank rolling onto the field! 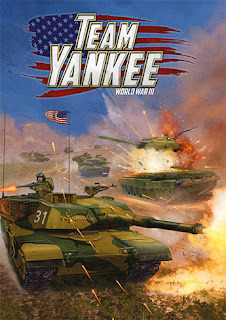 Finally, there is Team Yankee - at the moment, I must admit I haven't taken anything from TY yet... as it just seems like it doesn't have enough scope for my liking. Maybe in the future, but until then, well, we just wait and see! On the model front, I have to say I am really impressed by the designs coming online at the moment! With Heroic and Ros returning to service sometime around July 4 (so July 5 for us Aussies), they will be coming back in style with a fantastic model of the Mil Mi-26 HALO heavy helicopter and a number of other models coming online. There is also this year's GHQ production line - this year's lines are VERY interesting as well. I cannot wait to get some T-72B3Ms, the BM-27's are a godsend, and the T-55 ENIGMA model coming down the pipes couldn't have arrived sooner! I like where you're going with this, Nat. FFT is a great set of rules and the extras you're adding will give nice background flavour. Sounds like it'll be a fun setting.